Buy Online Now! Classic Accept Concert Posters and Memorabilia. With their brutal, simple riffs and aggressive, fast tempos, Accept are one of the top metal bands to debut in the early ’80s, and a major influence on the development of thrash. Led by the unique vocal stylings of screeching banshee Udo Dirkschneider, the band forged an instantly recognizable sound and was notorious as one of the decade’s fiercest live acts. Despite recording two of the best heavy metal albums of the decade in Restless & Wild and Balls to the Wall, Acceptremained too heavy and extreme for American audiences to embrace — even when they tried to tone down their act with more melodic songs. Ultimately having conquered the rest of the world, but with their career stalled in the U.S., Accept fell apart, but reunited years later to confront a radically changed music marketplace. 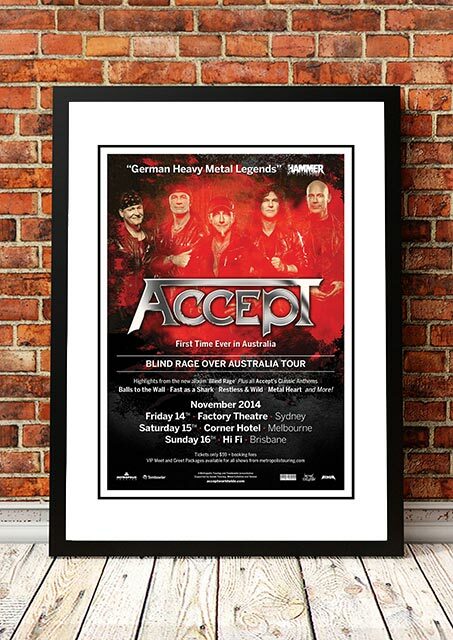 We stock an awesome Accept Australian Tour Print.